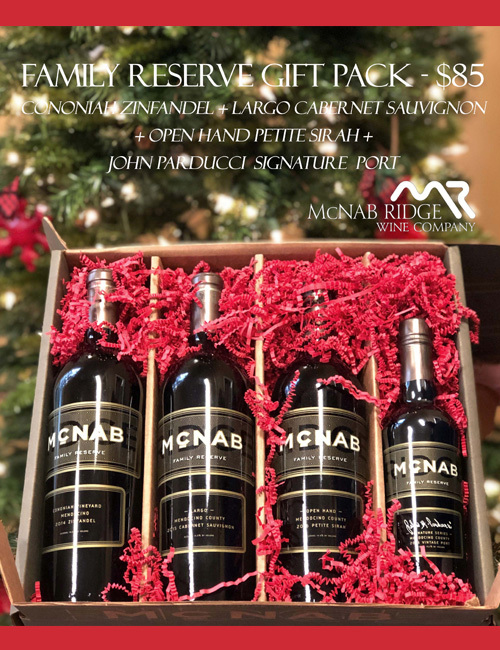 McNab Ridge's Family Reserve Holiday Gift Pack includes a bottle of 2014 Cononiah Zinfandel, 2015 Largo Cabernet Sauvignon, 2016 Open Hand Petite Sirah and John Parducci's Signature Series Port. Red craft paper and Lindt Chocolate truffles adorn this McNab Custom wine box for an elegant and decadent gift this Holiday Season. $85 + tax & shipping!